The prop is expected to start against Scotland this Saturday. Opportunity knocks for Dave Kilcoyne. 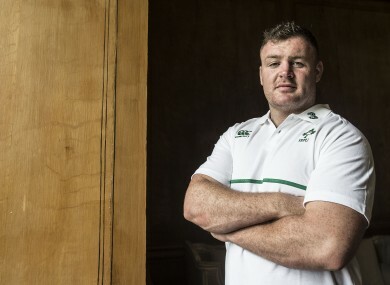 IF SPORT IS about seizing an opportunity when it presents itself, then Dave Kilcoyne knows this weekend is crucial as he looks to force his way into Joe Schmidt’s plans ahead of the World Cup. Ireland face Scotland in their second warm-up fixture this Saturday ahead of next month’s tournament as Schmidt looks to run the rule over the players on the periphery of his final 31-man squad. With the competition for places all over the pitch as fierce as it is, Kilcoyne acknowledges that every minute, whether it’s on the pitch or in training, is crucial. “Everyone is really eager to get out there,” he said. “I was lucky enough and got a few minutes against Wales but will want much more in this game. The Munster prop was a second-half replacement at the Millennium Stadium during Ireland’s 35-21 win but is expected to get his chance from the start this weekend. Whether Cian Healy will be fit enough in time for Ireland’s campaign opener against Canada on 19 September remains uncertain so the incentive, if any more is needed, couldn’t be greater for Kilcoyne. “I can only speak from my own point of view, as you said it is about making the most of the minutes you have on the pitch,” the 26-year-old continued. “If you get distracted, worrying about outside influences, things out of your control, you lose focus. Everyone’s mind is on the game at the moment. “Every minute in here counts so you are trying to maximise your time on the pitch and make sure you are putting in good performances at training. The Ireland squad have been given the option to leave camp this evening and tomorrow before reconvening on Wednesday evening to prepare for the visit of Vern Cotter’s charges to Dublin. With places on the line, there is an edge to training with the intensity being raised each day as the stakes increase day-by-day and Kilcoyne admits that can only benefit the team. “If you look at the games and how competitive the squad is at the moment, it is a real competitive squad and there are going to be new combinations week in, week out through selection or injury and it’s having a really competitive squad that will determine your success. Ireland have three more warm-ups games ahead of their campaign opener. Saturday’s victory in Cardiff was the perfect start for Ireland at the beginning of what is a crucial couple of weeks but Scotland will provide a different challenge at the Aviva Stadium. “I have first-hand experience when playing against Glasgow in the final (Guinness Pro12) not so long ago and they were deserved winners,” Kilcoyne adds. “They play an expansive game plan and they are very good at it. There’ll be a blend of that and with a new coach there will be a bit of everything in it. “There will be new combinations and so it is about making it a seamless transition and executing our game plan to the best of our ability. Email “Kilcoyne determined to seize his chance with uncertainty surrounding Healy's fitness”. Feedback on “Kilcoyne determined to seize his chance with uncertainty surrounding Healy's fitness”.